Photos courtesy of the Green Bride Guide. If you’re planning a backyard wedding, play to the outdoor setting with decor and accessories that embrace nature’s themes and use eco-friendly materials, like the items in the Garden Wedding line from the Green Bride Guide. We’ve highlighted some of our favorites in the pics above. Clockwise from top left: upcycled garden wedding invitations; jasmine head wreath for bride, bridesmaid, or flower girl; felt rose garland, plantable favor cards shaped like love birds and infused with flower seeds, lavender in a box wedding favors, and love bird wedding cake toppers. We love that the Green Bride Guide provides modern designs for eco-conscious wedding couples, and Huppahs.com is proud to be an approved vendor of the Green Bride Guide. When planning your wedding, consider skipping the traditional favors and using the money instead to make a donation to your favorite charitable organization in your guests’ honor. 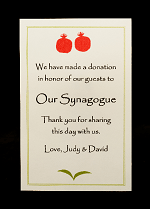 On the table where guests would normally look for a favor, tell your guests about the donation with stylish tzedakah cards. Free printable tzedakah card templates. This is an excerpt from an article I wrote that originally appeared in Washington Jewish Week’s 2011 Wonderful Weddings guide. Sometime between Adam and Eve’s expulsion from Eden and the rise of Martha Stewart, giving favors to your wedding guests became an expected custom. The wedding industry offers many choices, including small picture frames, candles, and organza-wrapped candies, but finding the right favor can be tricky. You want a gift that adequately expresses your gratitude to your guests without straining your budget. Favors generally cost between $1.25 and $3.50, but multiply the price times the number of guests and the cost adds up quickly. Moreover, you want a favor that looks worthy of a place on your reception table. That’s a lot to ask from $3.50, let alone $1.25. In the post-wedding analysis, brides and grooms often look back and wonder if their wedding favors were worth the effort and expense. 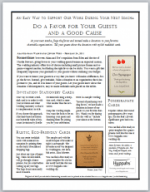 If you want to honor your guests in a way that you know will make a difference, forgo the favors. Instead, make a donation to an organization or cause that is important to you, and do it in honor of your guests. Giving charity, tzedakah, is always a wonderful idea, but in tight economic times your gift can make an especially big difference to a cause that is important to you. Honoring your guests with a gift that impacts the larger community is a way to spread your wedding joy. The size of the donation is up to you and the constraints of your budget. As a rule of thumb, three percent of the wedding budget goes to favors. If you plan to redirect this money toward a charitable contribution and your overall wedding budget is $10,000, the amount of the donation would be $300. 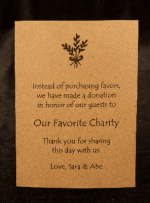 Let your guests know about the donation in a simple, inexpensive, stylish way. On the table where guests would normally look for the favor, place a card that tells them about the gift. You can create a tzedakah card for only a few pennies, and creating a card that fits the feeling of your wedding and looks great on the table is easy. Depending on the method you chose to make the cards, you can do it in less time than it takes to lasso candy into bundles of organza. This article has been turned into fundraising flyers that can be used by charitable organizations to encourage donations.